Parts for Tire Changers, Vehicle Lifts, Brake Lathes, Wheel Balancers, and Alignment Equipment. Parts for all the popular brands like Coats, Rotary, Hunter Engineering, J.B.C., Ranger, Snap-on, Bendpak, Ammco, and Hofmann. Also hard-to-find parts for un-branded and privately branded equipment. 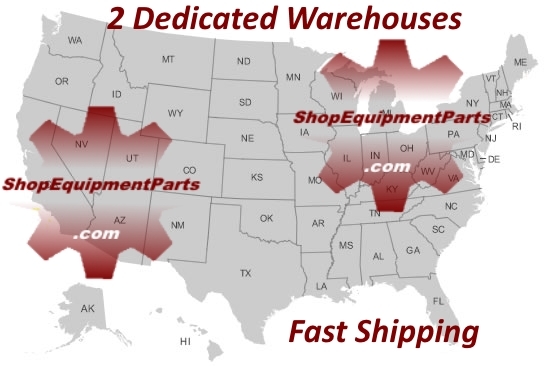 We have a large inventory for fast shipping, and knowledgeable support staff with over 30 years of shop equipment experience. Use the Categories on the left, or the Search Tool at the top, to quickly find what you need. You can order online 24/7 or call us directly at 928-377-4418 (US & Canada, 9am to 6pm central time). Alignment TURN-PLATES, Set of 2 - Stainless Steel, Standard Duty. Ships Free in USA*. CYLINDER, Wheel Clamping; for Coats brand. OE, 8182613.